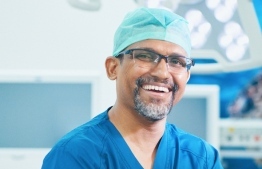 Local surgeon Dr. Mohamed Shafiu makes history yet again, as the leading surgeon to perform the first Coronary Artery Bypass Graft (CABG), more commonly known as Bypass Surgery in the Maldives. The nine-hour surgery was performed by Dr.Shafiu at ADK Hospital's Hassan Ibrahim Tier of Excellence in Cardiovascular Care and Theatre Complex (HITECC). He was accompanied by Nepalese surgeon Dr.Ranjan Sapkota. According to Dr.Shafiu, the decision was made on the spot as the patient was in very critical condition and they faced some difficutles due it. The surgery was performed on a 54-year-old Maldivian patient who was taken to ADK hospital after suffering from a heart attack. According to ADK's website, the patient is currently in recovery at the hospital's HITECC Coronary Care Unit. In the statement given to local media outlet Mihaaru, Dr. Shafiu said that, "The historical surgery performed at ADK last night was a great progress for the Maldivian healthcare system." He also revealed that back in 2015, he had relocated to India because, at that time, Maldives did not possess the technology required to practice his field of medicine. However, he noted that Maldives now has the technological advancements locally available for doctors to be able to perform such high standard surgeries. The super-specialist doctor began his career in 2013, as the first local Cardiothoracic and Vascular Surgeon in the Maldives. In 2015, Dr.Shafiu took part in an extremely delicate Pediatric Cardiac Surgery which was performed for the first time in India on a Maldivan boy. He was then working at Kokilaben Dhirubhai Ambani hospital in Mumbai. Currently, Dr.Shafiu is a Cardiac Thoracic and Vascular Surgeon and the Chief Surgical Officer (CSO) at ADK hospital. He has worked and contributed endlessly to the Maldivian health sector for over 15 years.